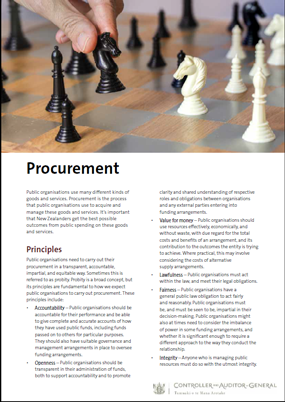 We encourage all public organisations to consider whether they understand their obligations and responsibilities at each stage of the procurement life cycle and that the processes they follow in procurement enable them to be held to account. Have you clarified roles, responsibilities, and processes for decision-making, ownership, and oversight? 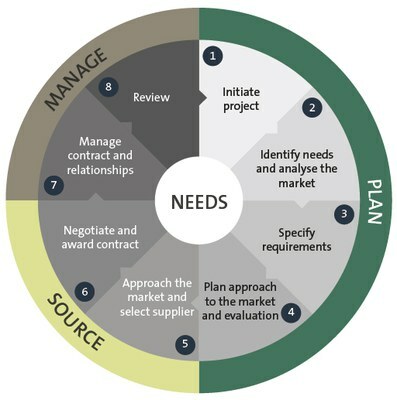 Have you identified your needs and analysed the supplier market? Do you have a clear understanding of what you want to purchase and a plan of how you will measure supplier performance? Do you have a plan for your procurement approach? What processes do you have to implement the procurement process, including evaluating tender responses and making decisions about suppliers? How will you negotiate a contract’s terms and conditions? What processes do you have in place to monitor and manage supplier performance? Does your organisation assess whether the intended benefits from a procurement have been realised? What lessons can be learned from the procurement process?